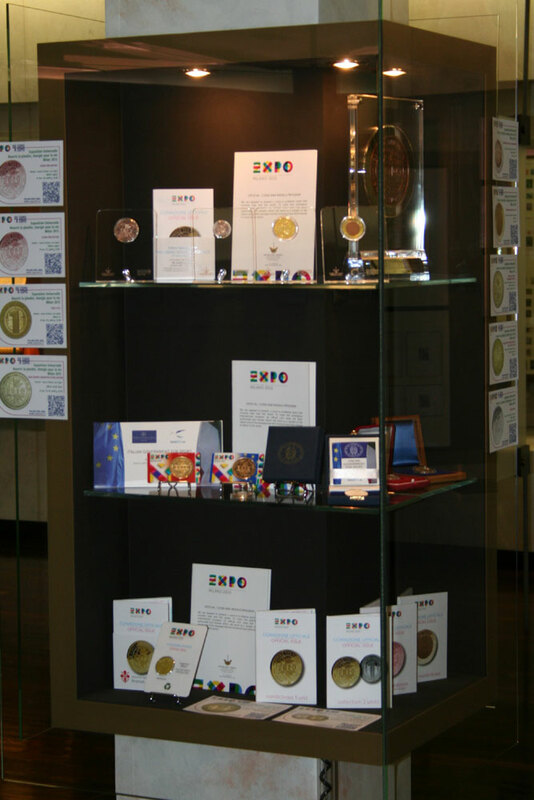 The organizers of the official EXPO 2014 coins & medals programme opened a new exhibition on the 2nd December in the heart of Monte Carlo where nearly 100 medals and coins went on display. Many of the rare and seldom seen medals were showcased at Monte Carlo’s prestigious Musee des Timbres et des Monnaies. Umberto Moruzzi, curator of the EXPO 2015 Medals collection greets Magali Veresi, Director of the Office of Emissions, Monaco Post at the opening of the EXPO to EXPO exhibition, Monte Carlo. The Musee des Timbres et des Monnaies is associated with Monaco Post. As part of the launch, the curator of the collection, Mr. Umberto Moruzzi, offered a personal tour of the exhibit to the Director of the Office of Emissions for Monaco Post, Ms. Magali Vercesi who was shown many of the outstanding medals issued within the 163 year period from the Great Exhibition to the upcoming international event which Milan will be hosting from the 1st May 2015. Among the medals was a bronze piece issued during the 1889 Exposition Universal hosted by Paris during which the Eiffel Tower was erected. The piece was inscribed for the then-Prince of Monaco Albert I who attended the Expo and was himself a keen Oceanographer with a worldwide reputation in this field. 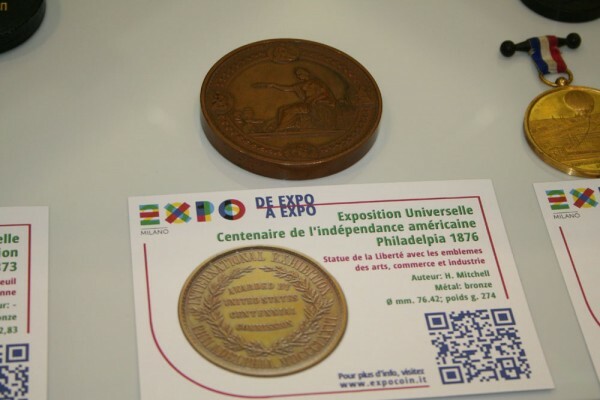 Other medals of particular interest include a large bronze medal issued in 1876 for the Universal Exposition hosted in Philadelphia, the medal is inscribed with the mention of the American Centennial anniversary. Among the other highlighted medals taking pride of place was a spectacular 1851 bronze prize piece awarded by Queen Victoria during London’s Great Exhibition, held in Crystal Palace and arranged by her Husband, Prince Albert. The medal includes exceptional portraits of the Royal couple along with an allegorical figure on the reverse. 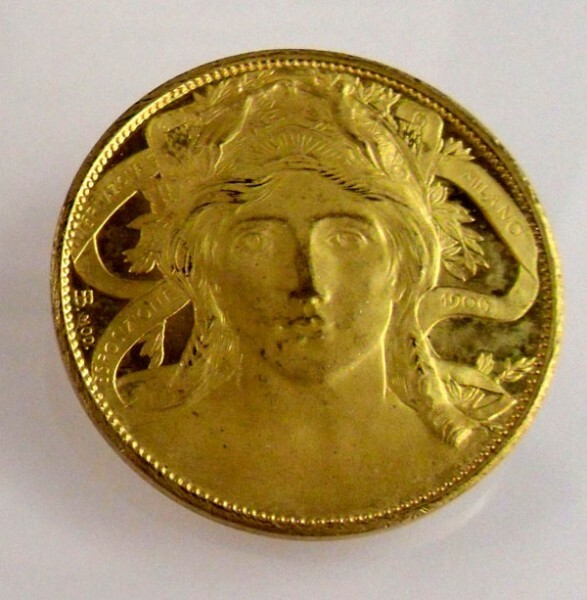 As this is Milan’s second time hosting this international event, the first official EXPO medal was also included in the exhibition, a rare gold piece with a front-facing allegorical figure inscribed with the date of the event, 1906. 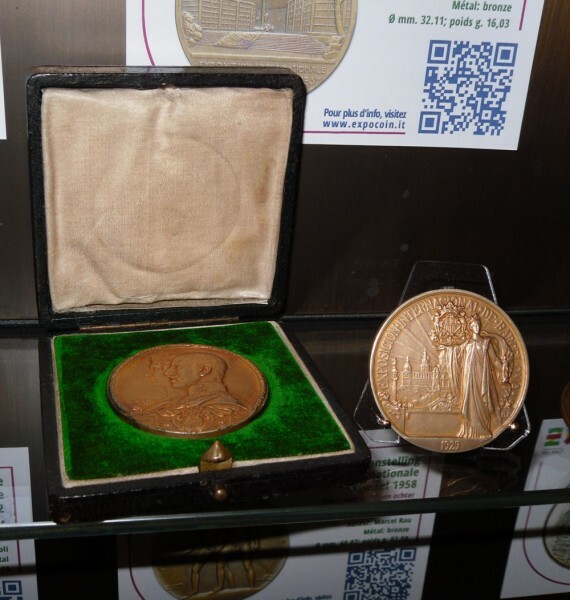 Barcelona’s medal for the 1929 EXPO featuring a double-portraited medal of King Alphonso XIII and Queen Victoria Eugenie is also included. 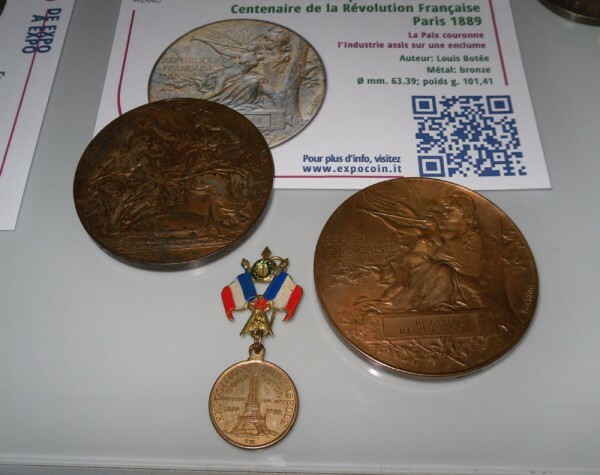 As France has hosted many of the worldwide events, there were several examples of these beautiful medals featuring busts of Emperor Napoleon III and early representations of “Mariane” a national symbol of the French Republic, an allegorical figure of liberty. 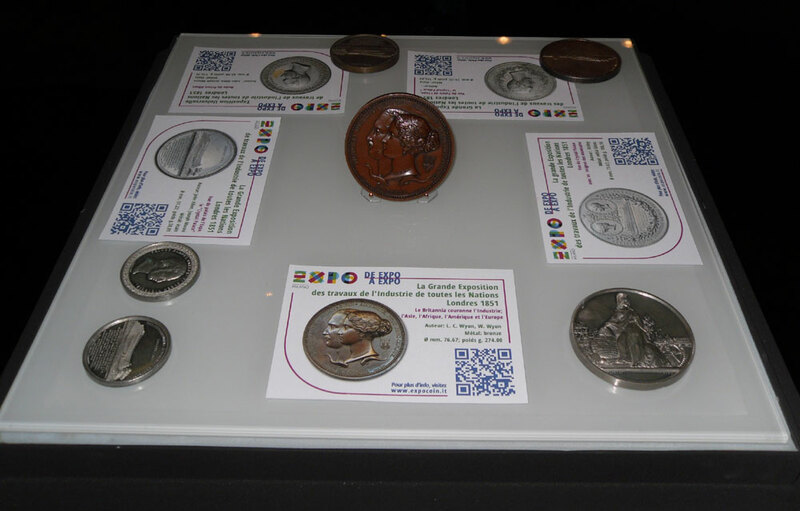 The display also included the latest offerings from the Museo Del Tempo, organizers and exclusive licensees of the official EXPO 2015 Milano coins and medals programme. Included in the line of products to be launched during the Numismatique Bourse, Monte Carlo will be platinum, gold, silver and Nordic brass versions of the specially designed insignia which will be used for the entire line of official coins and medal souvenirs. 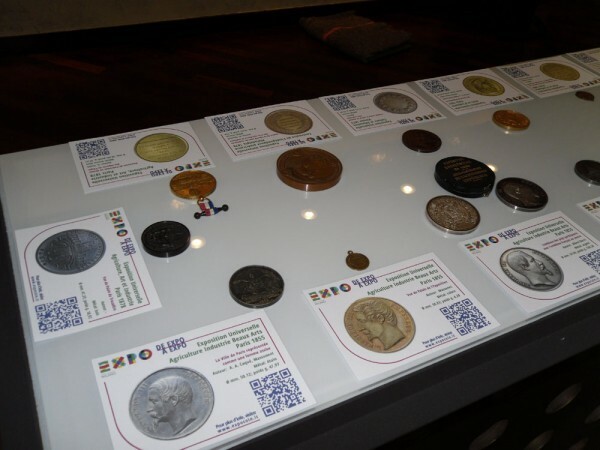 As an additional product, the organizers will produce a set of EXPO 2015 Milano coin-medals which will include names of major cities in Italy on the obverse – already minted is the example representing the beautiful city of Florence with additional pieces to follow in the months leading up to the opening of the EXPO in May 2015. 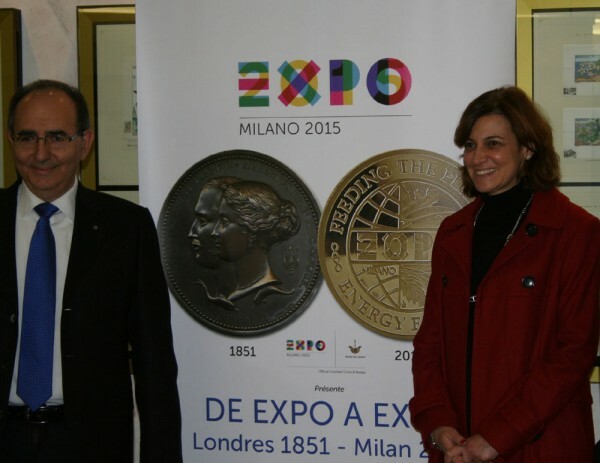 Dr Sandro Sassoli, whose company Museo del Tempo is the exclusive licensee of the EXPO 2015 Milano official souvenir medal presents Magali Vercesi with the latest product during her visit to the EXPO 2015 Milano exhibition at the Musee des Timbres et des Monnaies, Monte Carlo. Yesterday I bought the Barcelona’s medal for the 1929 EXPO featuring a double-portraited medal of King Alphonso XIII and Queen Victoria Eugenie. I found it on the antique market in Tbilisi (Georgia). The covered box was not there, just the medal. In the side edge I saw the number 916. It is not in mint condition but the relief is quit good. I have no idea about the value or how rare it is. Can you help me out estimating a value? Thank you very much. If you can send me an image of the medal, I can send it to a colleague who may be able to shed a little light as to its value. Also, it would help to know what metal it is made from and its diameter, that can sometimes help when the item isn’t in front of us to determine the actual piece. I just purchased a coin for the 1967 expo. One side says United States Pavilion expo67 with an image of the dome the reverse states United States Of America with the eagle. The rim is marked Medallic Art Co. NY. I was wondering if you had any additional information on it? I have researched all over the internet have been unable to find anything else. I’m not an EXPO medal expert but, if you can post a link with images of the medal, I can certainly try & find out some additional background which I could post here.